A couple of years ago, I won four one-day Disneyland Resort park-hopper tickets (along with some other Disney tchotchkes) in a raffle. I used the first two tickets in October, 2012. The tickets were going to expire the third week of March, 2014, so I had to schedule a trip before then. I was on a full-time work contract until the end of February, so I scheduled a trip for the second week of March. I decided to spend three days at DL to make sure I could do everything I wanted without feeling rushed, even though that meant I would have to pay for the third day. I included a Friday so that I could see Fantasmic, which only runs two nights a week at this time of the year. I scheduled my return flight for late afternoon Saturday so that my Southern California friends and I could do a bit of geocaching before I left. My friend Ronny (who is also my catsitter) drove me to Mineta San Jose International Airport this morning. We got there about 8:20, more than an hour before my flight. I checked my non-carry-on bag at the outside Southwest Airlines kiosk and headed inside. The first TSA person who looked at my boarding pass told me that I should go to the TSA Pre✓ line. When he saw that I looked confused, he asked whether I'd been through Pre✓before. I said I hadn't, so he explained that it meant I wouldn't have to remove my shoes or jacket, and that I could leave any electronic devices and small liquid containers in my carry-on bag. Okay, sir, sounds good to me! There was only one other person ahead of my when I got to the actual security screening area, so I was at my gate within four or five minutes of arriving at the terminal. The flight to John Wayne Airport was on time and smooth. 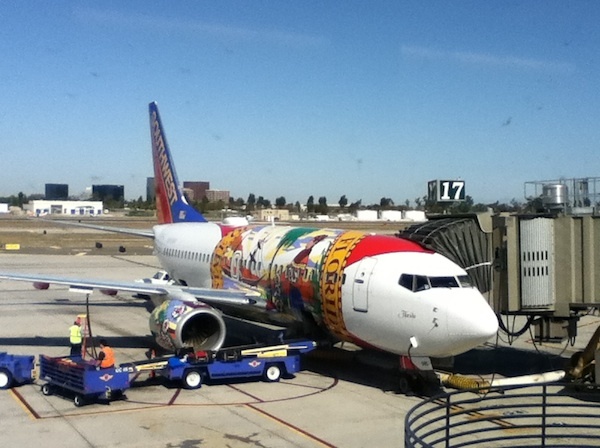 The plane, by the way, had special livery honoring the state of Florida. I enjoyed the views of the San Andreas Fault alongside the Carrizo Plain, and of Santa Catalina Island. I saw snow on Mount Baldy (a ski area for Los Angelenos) as we were coming in to Orange County. I had gotten an email from Southwest the day before the flight saying that I could watch free TV courtesy of Dish Network, but I didn't read the whole message before I left, so I never tried connecting my iPad to the plane's Wi-Fi on the way south. More on that in my Saturday report. A couple of notes about transportation from SNA (John Wayne Airport in Santa Ana) to Disneyland. I'm pretty sure that several years ago, SuperShuttle's rates went up, and that's why I started taking Grayline's Disneyland Resort Express or other shuttles. Unfortunately, the Grayline shuttle is now down to once an hour, the next one being about 45 minutes after I got out to the shuttle area. So I took one called "Pronto," which, according to the card the driver gave me, is one of several companies coordinated by "SNAshuttle.com". The $10 fare to Anaheim sounded good, and the ride worked out okay, but there were a couple of things that turned me off. First, I was sitting on the front-most bench seat, and I couldn't get the far left seat belt around me. I'm not THAT fat. When some other folks got on, I moved to the far right, but that one didn't fit, either. I decided that the bench seat must be too far forward. I could have asked everyone to get up so the driver could move it back, but I wasn't sure what that would do to the legroom of the people behind us. So I crossed my fingers that we wouldn't get into an accident on the freeway. Which we didn't, even though--the second thing that concerned me--the driver didn't seem much inclined to signal lane changes or turned. Long story short, I discovered later that SuperShuttle also only charges $10 now between Anaheim and SNA, so I booked with them for the return trip to the airport. I got to the Candy Cane Inn about 11:30 a.m. My room wasn't ready yet; they offered me one on the first floor, but I like the view of the Tower of Terror and the fireworks from the second floor, so I left my bags at the front desk and said I'd check in that evening. I then caught the noon shuttle to Disneyland. I was making this trip to use up the final two of four free Disneyland tickets I had won in a raffle a couple of years ago. I decided to spend three days at the parks this time, so I had to get a ticket for a third day. I was hoping that I could upgrade the ones I had, but because I had complimentary tickets (I guess Disney donated them to the nonprofit group I won them from), they had no cash value, so I had to pay full price for a one-day hopper. Had I been more quick-witted while I was at the ticket window, I would have opted for the lower-priced non-hopper, since it would not be a hardship to spend one day at a single park. But I didn't think about that and automatically got a hopper pass for $137. By the way, there was a CM talking to people standing in line to buy tickets who was asking them what they needed to do. When I said I wanted to upgrade from two one-day tickets to a three-day hopper, he guided me over to a certain window. He said that lady was having a performance review and was specializing in upgrades. So by Disney having a CM pre-screening ticket purchases, he ensured that she got the practice she needed and that I dealt with someone who had the latest info about upgrades. Seems smart all around. Then it was time to enter Disney California Adventure! 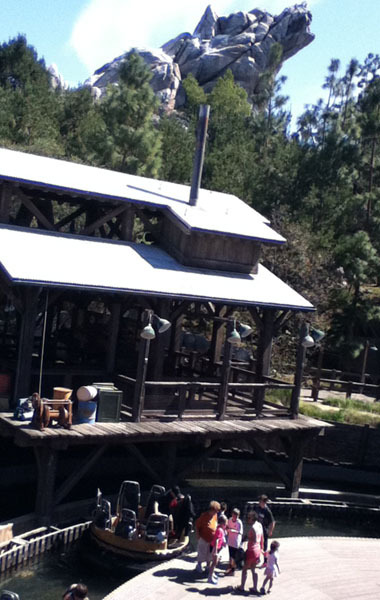 I had brought along a poncho and water shoes so I could go on Grizzly River Run, along with a jacket for the evening, so I headed for that ride, changed shoes, put on the poncho, and put my extra clothes into a locker. My plan was to change lockers every couple of hours until I met up with my friends Larry and Julie around 4:30. (The lockers are free for the first two hours. Note that this does not apply to the main Disneyland and California Adventure lockers, just the ones at GRR.) I then rode GRR twice in the next 20 minutes, using the Single Rider line. Although I also like the similar ride at WDW (Kali River Rapids), I think this one is more fun. The poncho worked great for the most part, protecting me from water coming from the front, back, or above, but the lower back parts of my cords got soaking wet from water splashing up from below. 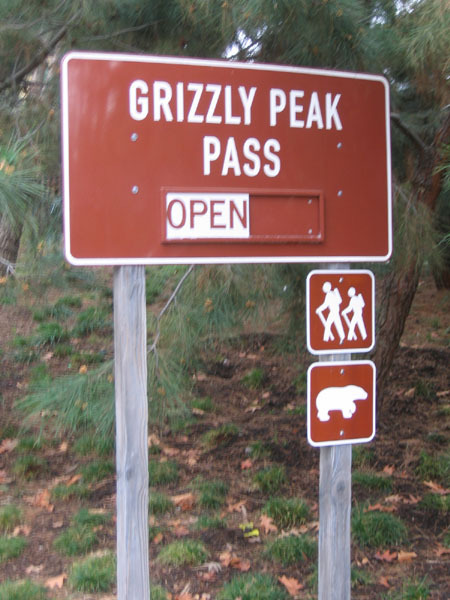 After my two wet rides, I took one of my favorite strolls, behind GRR on the Grizzly Peak Pass Road. I stopped for a few minutes to watch people coming down the large drop near the end of the ride. Then I walked around the edge of Paradise Bay to Toy Story Midway Mania, which I hadn't ridden in a few years. I inquired for the entrance to the Single Rider line and was told that this ride no longer had one. :-( Oh well, the 40-minute standby wasn't too bad. I did 72,200 points, which is not a particularly good showing, but I had fun. I liked that when there was a delay on the ride, they started up the targets again with 0-point settings so you could keep practicing your shooting without unfairly padding your total score. After TSMM, I walked over the bridge back to the north side of Paradise Bay, moved my stuff to another locker, and checked out the Single Rider situation on Soarin'. I discovered that there were already some 30 people in the SR lines, so I bagged that idea, got a FastPass for later, and went to the Ghirardelli Soda Fountain for a hot fudge sundae. Then it was time to head for Route 66 and Cars Land. 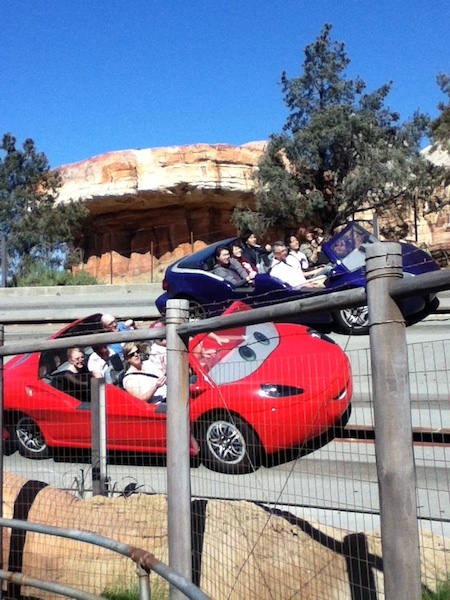 The Single Rider wait for the Radiator Springs Racers wasn't bad, about 20 minutes. The couple in the car with me said they had pulled FastPasses at 9:00 a.m. and were just able to use them now at 3:00 p.m.
After stopping for a few minutes along the exit path to take photos of other racers going by, I went back along Route 66 and discovered that there was only a 15-minute standby queue for Luigi's Flying Tires, so I went in there. As with the last time I went on the ride, I picked a tire that was toward the edge of the "rink," and stayed as clear of other tires as I could during the ride time, so that I could have some space to get up some good speed. Much more fun than getting stuck in a "tire traffic jam" in the middle of the rink. My Soarin' FastPass was about to become valid, and I had promised to meet Larry and Julie in Disneyland around 4:30-4:35 for the Flag Retreat, but I decided to swing through Flik's Fun Fair and take a spin on Heimlich's Chew Chew Train on the way. There was only a 10-minute wait, but as on my previous visit, I noticed that the smells weren't working the way they used to. In fact, this time I only smelled the watermelon. So that ride is off my to-do list now. I got to Soarin' at 4:12 and boarded about 4:30. When I got out at 4:40, I suddenly remembered about my locker at GRR. Realizing that I had now gone over my two-hour limit, I figured I might as well just pick up the stuff after dinner, since I had obviously now incurred the full-day rate. So I walked briskly over to Disneyland, getting to Town Square just as the announcer was asking everyone to gather around the flagpole. I quickly said hi to Larry and Julie before the Dapper Dans arrived to open the ceremony. They're both Air Force veterans, so they went and stood in front of the flagpole when veterans are invited to do so. I had invited Larry and Julie to be my guests for dinner at the Carthay Circle Lounge in DCA. I had chosen the Lounge instead of the main restaurant for two reasons: the entrees at the latter run from $25-44, and anyway, when I had checked the Disneyland website a couple of days earlier, it said the restaurant was entirely booked during dinner hours that evening. However, the offerings at the Lounge turned out not to meet everyone's preferences, so I checked at the desk and discovered that we could be seated upstairs in a few minutes. I guess, unlike at WDW, the restaurants at DL still hold spaces for walk-ins! I'm sure it helped that it was only a little after 5:00 p.m. and the place wasn't very full yet. By the way, I noticed on the menu that the Executive Chef at Carthay Circle is Andrew Sutton, who holds the same role at Napa Rose, the excellent restaurant at the Grand Californian hotel. As at Napa Rose, Carthay Circle has seasonal menus. Do keep both restaurants in mind if you want a special dinner next time you visit DL. Then we wandered over to Route 66. I had read in the DCA Times Guide that there's a lighting ceremony there every night at dusk. We got there just in time, a couple of minutes before it happened. It isn't anything fancy--no Disney characters or anything like that--but it's pretty. They turn on the lights along Route 66 one by one, starting with the beautiful Cadillac Range mountains at the far end, then each of the neon lights on the attractions (such as Luigi's), restaurants (such as Flo's V8 Café), and shops (such as Sarge's Surplus Hut). By now it was nearly 8:00, and both of us decided that we wanted to call it quits for the night. Larry headed for the tram to go to the Disneyland parking structure, and I caught the 8:15 shuttle back to the CCI, where I puttered around reading email and such until going to bed a little after 10:00. 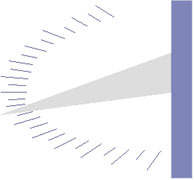 Text and photos (c) 2014 Patricia F. Winter, unless otherwise noted.